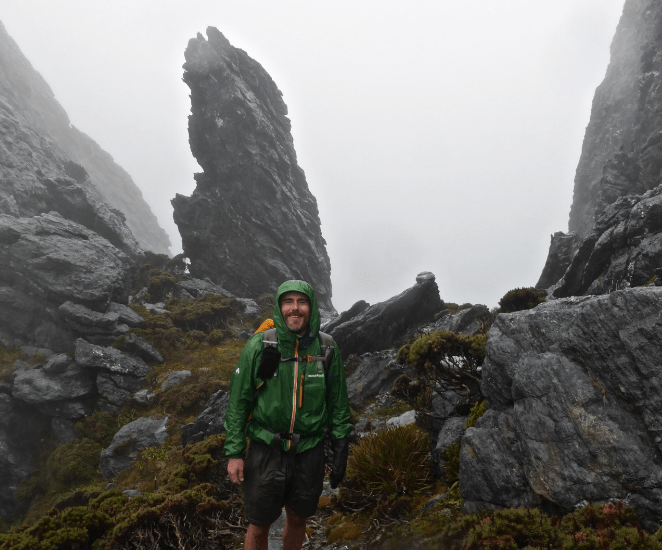 The ultimate in field tests for wet weather gear – Tasmania’s Arthur Range (March, 2016). 1. Forecast: Always check the forecast before setting out. Adapting is a lot easier if you know what’s coming. This is a good habit to establish irrespective of the climate. 2. Awareness: Watch the weather (forecasts can sometimes be wrong) and know your limitations. If conditions are deteriorating and you’re feeling exhausted, don’t hesitate to set up your shelter and call it a day. Sarek National Park​| Lapland, Sweden | W​ith its long valleys, winding rivers, glaciers and distinctive peaks, navigation in Sarek is not overly difficult when conditions are fine. However, when the mother of all storms rolls through, as it did during the last 1.5 days of my hike in 2009, much of your time may well be spent hiking through driving rain and thick fog. 3. Appropriate clothing: If you are hiking in cold, wet and/or windy weather for an extended period of time, it’s not so much a question of staying 100% dry (which is nigh on impossible), as it is maintaining a reasonable level of comfort whilst out on trail. Base layer: 150 or 200 Merino wool long sleeve shirt with zip neck (e.g. Montbell Super Merino Wool M.W. High Neck, Ice Breaker and Patagonia) . I’m a big fan of Merino wool: good warmth to weight ratio, quick drying, feels soft against the skin, and natural antibacterial properties means that it doesn’t smell as much as synthetic garments. I always go with zip neck models for their versatility over a wider range of temperatures. 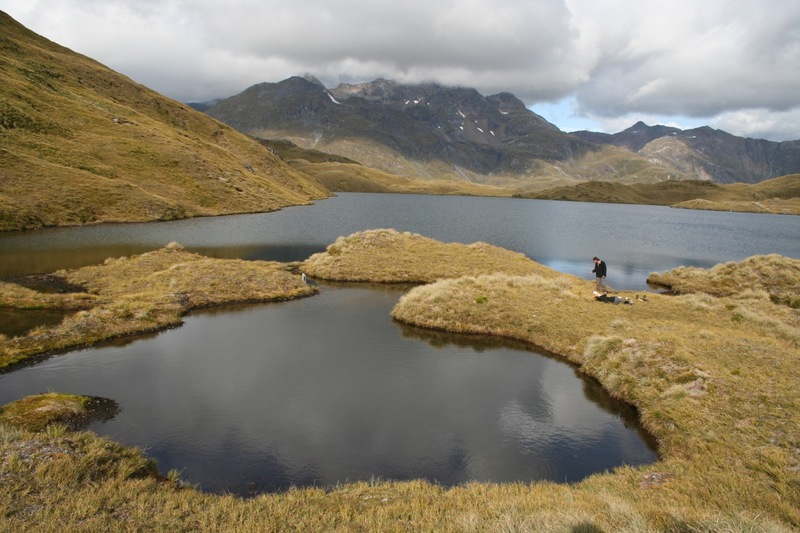 Dusky Track | Fiordland, New Zealand | Accessible only by air or water, the Dusky is situated in an area that receives an average of 8000 mm (315 inches) of rain per year (photo courtesy of Olivia Darras – Feb, 2010). Insulation Layer: When heading out into areas subject to heavy precipitation, I leave the down jacket and/or vest at home and instead opt for Fleece and/or synthetic fiber garments. Long time favourites include the Montbell Thermawrap Jacket & Vest and the Patagonia R1 Hoody & R2 Fleece Vest. 6. Fully adjustable hood with a stiff brim. Jacket preferences? 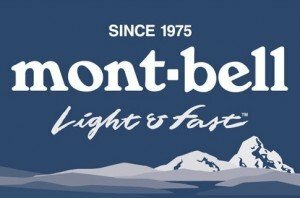 : The last few years I’ve mostly been using a Montbell Peak Shell Jacket. It has performed very well in a wide variety of environments ranging from Southwest Tasmania to the Colombian Andes. For three season hiking on well maintained trails and/or open terrain (i.e. no bushwhacking or overgrown terrain), I think the DriDucks Ultra-Lite 2 Jacket represents great value, particularly for folks on a tight budget. Looking a bit like an Antipodean version of Big Bird in my DriDucks Ultra-Lite Jacket | Cordillera Blanca Traverse, Peru, 2014. Lower Body? : I usually take a combination of lightweight/quick drying “waterproof” pants (e.g. Montbell Versalite), along with a pair of lightweight long underwear to use at night (e.g. Patagonia Capilene 2, Montbell Merino Wool L.W. Tights). 4. Umbrella: Whether or not I take an umbrella into cold and wet conditions, depends on the character of the environment. For extended on-trail hikes in forests (i.e. relatively sheltered), I have found an umbrella to be worth its weight in gold by helping to keep my core temperature regular. 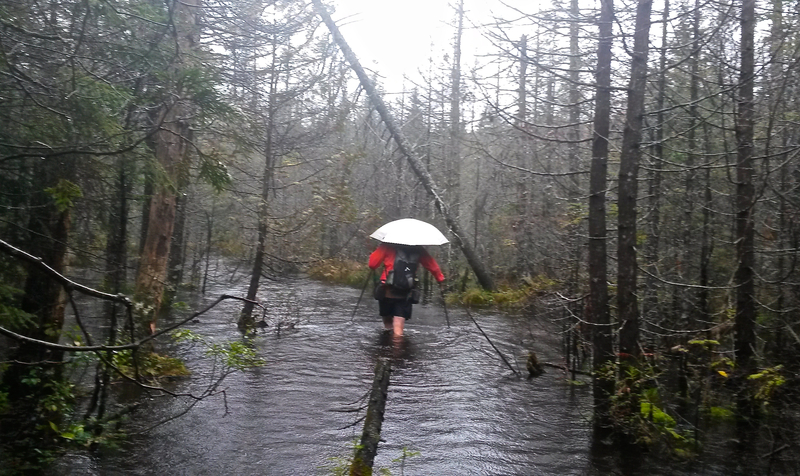 For example, during my late fall/early winter hike of the Appalachian Trail in 2012, an umbrella helped to keep my torso warm and dry despite near constant precipitation and temps that rarely got above 5°c (41°F). On the other hand, if I’m venturing off-trail and/or into exposed, above-tree line areas prone to driving wind and rain, umbrellas are usually more trouble than they are worth. 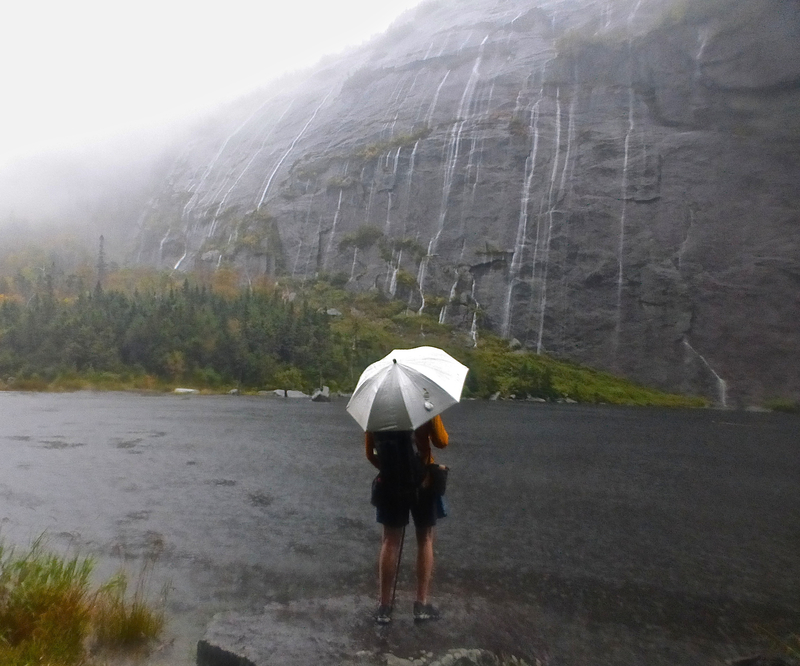 Greg “Malto” Gressel watching the cascades pour down into Avalanche lake | High Peaks, Adirondack Mountains, NY (Oct, 2015). 5. Avoid sweating: Over-dressing and/or over-exerting can lead to excessive perspiration, which in turn can result in a lowering of body temperature. Constantly monitor yourself and remove or add layers accordingly. Make ‘not sweating’ a priority. This is one of the biggest reasons to bring along an umbrella; they can’t be beat when it comes to ventilation. 6. Pay Attention to the Extremities: Your head, hands and feet constitute the body’s initial warning system in cold conditions. For trips in cold and wet environments, I take a fleece beanie, thin wool gloves, MLD eVent Rain Mitts and merino liner socks. I also carry a third pair of thicker wool socks (always kept dry) to wear at night, or for use on my hands in lieu of mittens if temps drop below freezing. Dientes Circuit | Situated on the Isla Navario, the starting & finishing point for this spectacular hike is Puerto Williams, the southernmost town in the world (Feb, 1997). 7. Short breaks: The longer you stop the colder you become. When the weather turns nasty, keep breaks short and to a minimum. If for whatever reason you do need to take a longer break, put on an extra layer or two until you begin hiking again. 8. Food & Water: During the day eat high-energy snacks at regular intervals. Before going to bed, your evening meal should emphasise fats and proteins, which are processed slower by your digestive system. Keep a chocolate bar in your sleeping bag, in case you wake up cold and hungry in the middle of the night. (Note: you may want to disregard this last suggestion if you are hiking in bear country outside of winter). 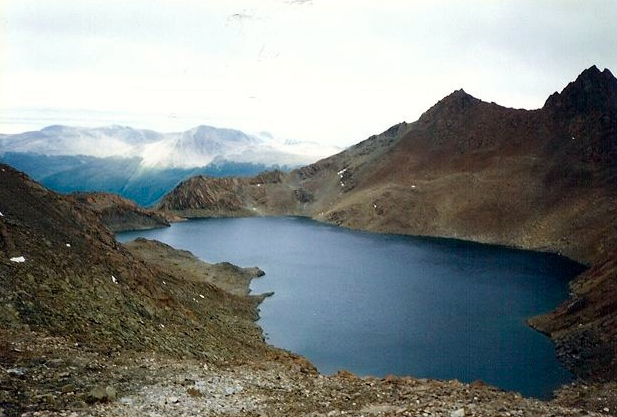 In cold and wet conditions, hikers often forget to drink enough water. Big mistake. If you are dehydrated you are more susceptible to hypothermia (see Hydration for details). 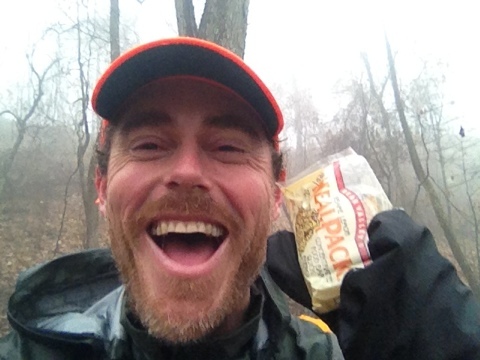 About to eat my 600th and final MealPack bar of the 12 Long Walks | Appalachian Trail | Early December, 2012. 9. Pack Liner: Use a trash compactor bag to line the inside of your backpack. There’s not much point staying comfy during the day, if the rest of your gear (particularly your sleeping bag) is soaked when you arrive at camp. Location, location: Look for a spot that has good drainage; avoid depressions, gullies and if camping in established sites, be wary of setting up on highly compacted areas where water may pool during heavy precipitation. If rain is accompanied by high winds, try to find a place that is at least somewhat sheltered from elements. If camping close to watercourses, be sure to set up above the high water mark. 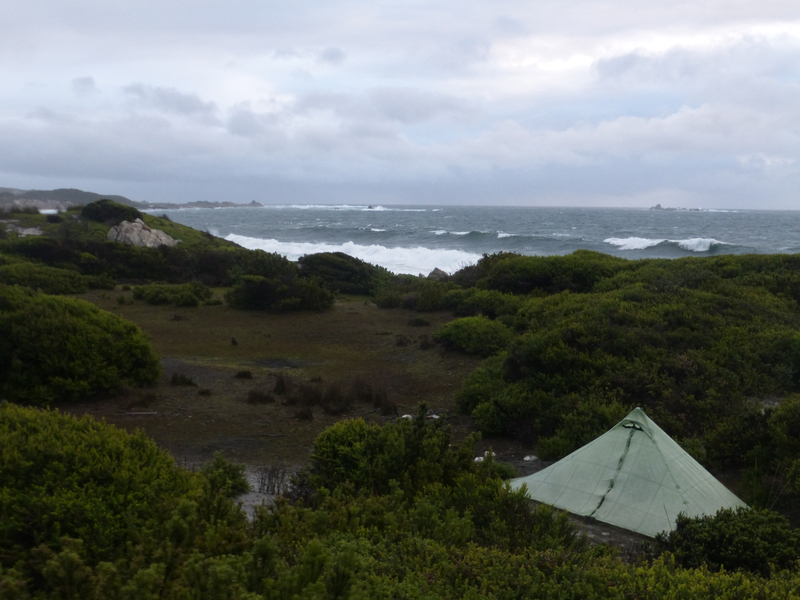 Sheltered campsite in the low-lying scrub of Tasmania’s remote southwestern coastline (Feb, 2016). Preparation: Have your shelter at the top of your pack ready for immediate deployment. If you are heading into areas known for inclement conditions, make sure you have plenty of practice erecting your tent or tarp quickly. You don’t want to be faffing about with poles and guylines when its raining cats and dogs. Consider Waiting: Often deluges don’t last more than 20 or 30 minutes. If it’s really coming down and you suspect that the storm may pass quickly, consider biding your time under a nearby tree (Two Points to Note: 1. Trees aren’t always around when you need them, and; 2. This would be a good moment to break out the umbrella). Make the most of your wait by preparing stakes and poles. If its chilly, put on an extra layer, have a snack and do some pushups. Before Entry: Fill up your water bottles, double check all the stakes are well set, pee if necessary and just before you are about to enter, quickly get out of your wet clothes and footwear; this last part can be done in your shelter’s vestibule if it has one. Inside Your Shelter: Dry yourself, put on some warm clothes and make sure your wet items are separate from your dry stuff (once again, a vestibule is the ideal place to store wet items – see #11 below for exceptions). After you have settled in, try to avoid touching the walls in order to minimize condensation. Depending on design of the shelter and how hard it is raining, try to maximize ventilation by leaving the shelter’s entryway slightly open. Tarps are hard to beat for ventilation, but don’t offer the same all-round protection of enclosed shelters | Sangre de Cristo Traverse, Colorado, 2016. During the Day: If you have a window of clear weather during the warmer hours, be sure to take the opportunity to dry out your gear. A combination of the sun’s rays plus a little breeze, will see most shelters fairly dry within 20 to 30 minutes. Do this for two reasons: 1. Dry stuff is lighter than wet stuff, and; 2. It’s a comforting feeling knowing that you have a dry shelter to get into at day’s end. 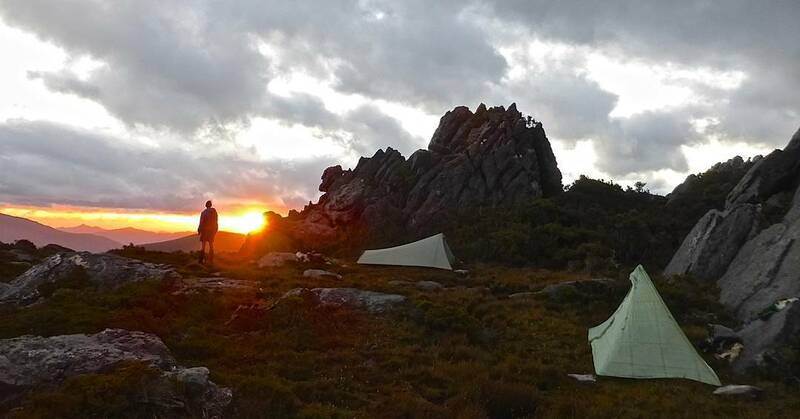 Taking in a gorgeous sunset during a rare (and much appreciated) dry afternoon | Arthur Range Traverse, Tasmania, 2015. Gloves – I put directly against my head underneath my beanie. Wet socks – I place down my long johns. 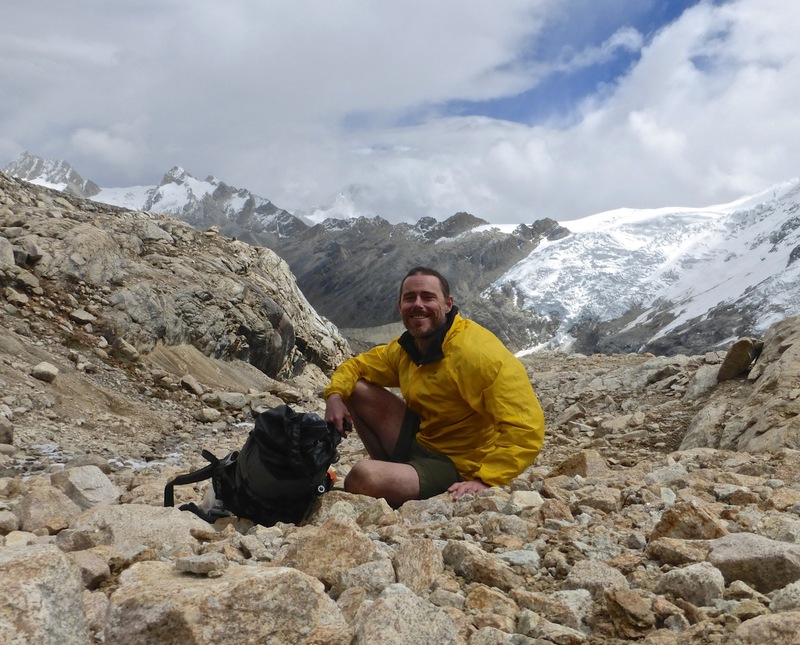 Hiking shirt – I will either wear over the top of a thin merino wool t-shirt or fleece, or alternatively (if it’s soaked), place it between my sleeping mat and the shelter floor. Note: I usually avoid putting wet items directly against my sleeping bag/quilt, as the moisture can compromise the bag’s insulation. 12. Attitude: Once you have the gear and experience required to hike safely in cold and wet conditions, the key is perspective. Yes, the conditions are challenging, but moaning and complaining won’t improve them. Stay positive by viewing such times as stepping stones rather than stumbling blocks; learning opportunities provided by Mother Nature that will ultimately help you to improve your backcountry skill set. Great post, with lots of useful tips. One to add, keep a few lightweight plastic bread bags handy for pulling on over your socks and/or gloves to keep out the wind and water/sleet/snow. I see more and more trampers using them here in New Zealand. Even with frequent river fording the bags usefully help to keep your feet warm, and I have found that when your laces are kept fairly tight they don’t fill up with water, a bit like neoprene dive boots. Ahh.. great to see some Adirondack photos in there. 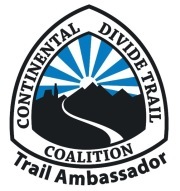 I did the Trans-Adk last October after coming off the CDT. Definitely had better weather. It was beautiful with all the fall colors coming out. Nice post and happy trails. We definitely had a couple of very wet days, but as you say, the colours at that time of year in the Adirondacks are incredible. Hi, good post. Familiar thoughts here! Only the shelter. I have much experience in wet and windy places in early spring, winter and late autumn, like GB, lake district, Lapland, Sarek, Schotland etc. I’m very happy with my laser competition2. I like its more spacy than the 1. You can life in it a day or two when there is too much rain and storm. My qustion: how do you do it in this conditions with just a tarp or one layer tent? 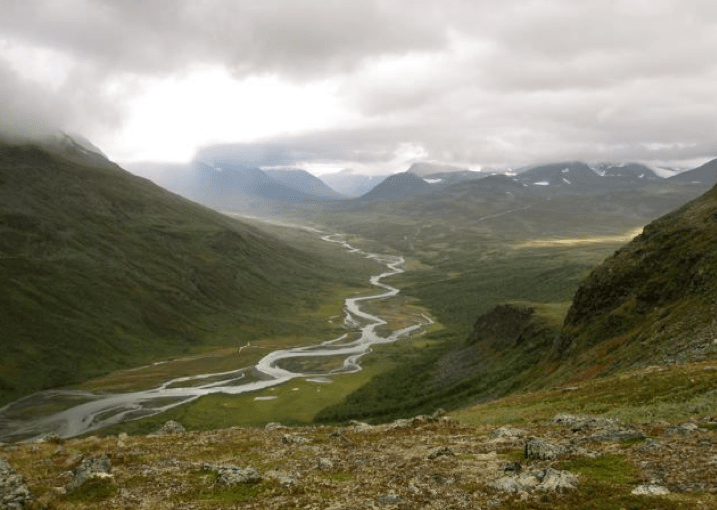 Sarek or Schotland without a good bathtub……I don’t know. The knowledge the shelter can be much lighter is tempting. Very curious. I think if you’re going to go with a lighter/floorless shelter in those sort of areas, there has to be an even greater emphasis placed on campsite selection. You want to be very sure that your chosen site drains well. Sometimes this might mean camping in a spot that’s a little more exposed (e.g. on a knoll). That being the case, you have to know that your shelter of choice will hold up well in strong winds if need be (e.g. MLD Trailstar, Solomid and Duomid). Sure, carfully selecting your pitch is important. A bit of wind nice to avoid condensation. Do you use a bathtub floor in combination with a tarp in these conditions? In regions prone to inclement conditions, I generally prefer a lightweight enclosed shelter like the Mids, rather than a tarp. During the height of midge/bug season, I’d also take a bivy (with bugnet window) or an attachable inner with bathtub floor for sanity’s sake. 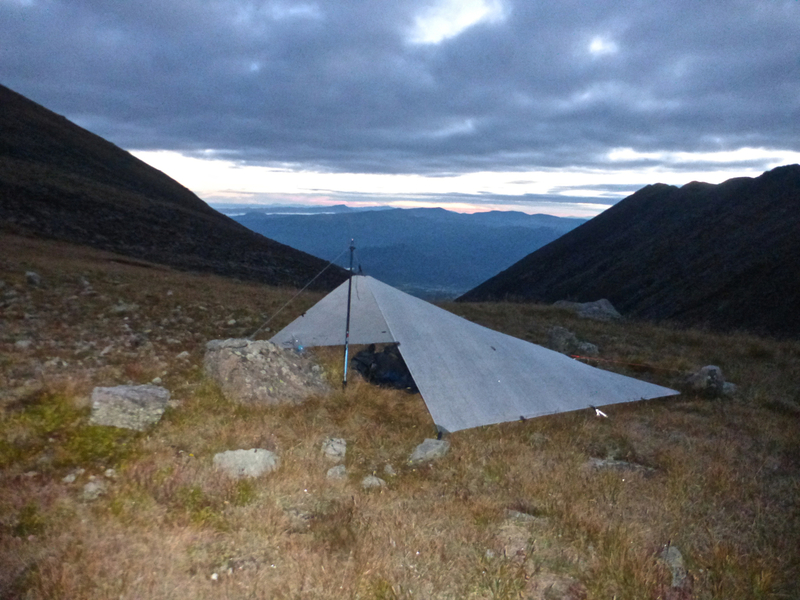 I should note that the tarp photo in the article was taken on a traverse of Colorado’s Sangre de Cristo range. During the hike I did encounter some very heavy storms, however, generally speaking that area doesn’t receive the same amount of precipitation (or bugs) as places such as Sarek, Scotland and South Island of NZ. I just got a SMD Lunar Solo. See how that thing turns out. Sound advise Cam,’just like to add something to attitude. Foremost thought is self preservation over comfort. Get back into your wet clothes in the morning – your dry ones are your survival gear. It’s uncomfortable but not as bad as the prospect of no dry clothes left. You are right Cam about wool, wring it and fling it to dispel as much water as you can, once on it quickly takes on your body temperature. Another point cold feet can take a long time to warm, making a hot water bottle will speed this up. Best wishes. Thanks for your comment. Being safe is always the top priority; that’s the principal focus of the entire article. Naturally you get into your hiking clothes first thing in the morning; however, if they are a little drier than they were at the end of the previous day, that strikes me as being a good thing! Oh and make sure you walk right through the first big puddle you see. Much better than trying to do the awkward, pointless dance for an hour trying to keep your feet dry (spoiler – they get wet eventually anyhow). Also keeps you from eroding the sides of the trail. This is a great blog for tips when hiking in inclement weather. We have a group of Scouts from our town who have just hiked to Pikes Peak. Out of 28 boys 6 made it all the way to the top. Some had to turn back because of weather. And, overnight they had a snow storm, which wrecked havoc. They and their sponsors are having a great time, even with the unexpected, which is really expected. Your tips are really great to have handy! In the sort of conditions I am addressing in the article, it’s a question of constantly monitoring yourself and removing or adding layers accordingly. Multiple lighter layers (e.g. merino wool zip neck base, wind shirt, Fleece or synthetic mid layer, lightweight rain jacket with pit zips) are ideal for cold and wet environments, because they provide the hiker with a greater degree of versatility. For heavy sweaters, umbrellas are hard to beat when it comes to ventilation.